Gomoku is an abstract strategy board game. Also called Gobang or Five in a Row, it is traditionally played with Go pieces (black and white stones) on a go board with 15x15 intersections; however, because once placed, pieces are not moved or removed from the board; gomoku may also be played as a paper and pencil game. This game is known in several countries under different names. It is said to have originated in China with the name Wu Zi Qi (五子棋). The name "Gomoku" is from the Japanese language, in which it is referred to as gomokunarabe (五目並べ). 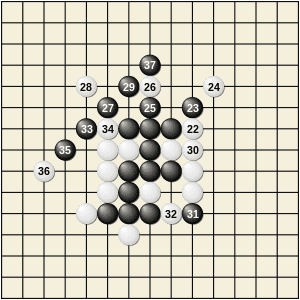 Go means five, moku is a counter word for pieces and narabe means line-up. The game is also popular in Korea, where it is called omok (오목 [五目]) which has the same structure and origin as the Japanese name. In the nineteenth century, the game was introduced to Britain where it was known as Go Bang, said to be a corruption of the Japanese word goban, said to be adopted from Chinese k'i pan (qí pán) "chess-board." Black (the player who makes the first move) was long known to have a big advantage, even before L. Victor Allis proved that black could force a win (see below). So a number of variations are played with extra rules that aimed to reduce black's advantage. 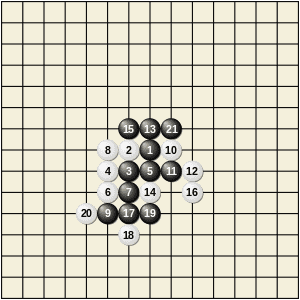 Standard gomoku requires a row of "exactly" five stones for a win: rows of six or more, called overlines, do not count. Free-style gomoku requires a row of five or more stones for a win. In Caro (also called Gomoku+, popular among Vietnamese), the winner must have an unbroken row of five stones and this row must not be blocked at both ends. 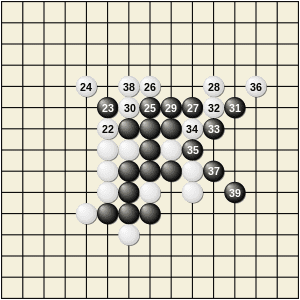 This rule makes Gomoku more flexible and provides more power for White to defend. Omok is played the same as Standard Gomoku; however, it is played on a 15x15 board and does not include the rule of four and four. The overlines and three and three rules still apply. The rule of three and three bans a move that simultaneously forms two open rows of three stones (rows not blocked by an opponent's stone at either end). The rule of four and four bans a move that simultaneously forms two rows of four stones (open or not). Alternatively, a handicap may be given such that after the first "three and three" play has been made, the opposing player may place two stones as their next turn. These stones must block an opponent's row of three. Efforts to improve fairness by reducing first-move advantage include the rule of swap, generalizable as "swap-(x,y,z)" and characterizable as a partially compounded and partially iterated version of the pie rule ("one person slices; the other chooses"): One player places on the board x stones of the first-moving color and a lesser number y stones of the second-moving color ("slicing" in the pie metaphor); the other player is entitled to choose between a) playing from the starting position, in which case the selecting player is also entitled to choose which color to play, and b) placing z (usually [(x - y) + 1]) more stones on the board at locations of that player's choice ("reslicing" in the pie metaphor, with limitations created by the board's existing setup akin to limitations arising from the existing slices in the pie), in which case the former player is entitled to choose which color side to play. Renju is played on a 15x15 board, with the rules of three and three, four and four, and overlines applied to Black only and with opening rules, some of which are following the swap pattern. Ninuki-renju or Wu is a variant which adds capturing to the game; it was published in the USA in a slightly simplified form under the name Pente. m,n,k-games are a generalization of gomoku to a board with mxn intersections, and k in a row needed to win. Connect(m,n,k,p,q) games are another generalization of gomoku to a board with mxn intersections, k in a row needed to win, p stones for each player to place, and q stones for the first player to place for the first move only. Each player may play only at the lowest unoccupied place in a column. Connect(m,n,6,2,1) is the most interesting one and is called Connect6. The only fair opening rule currently is swap2 based on swap from Renju and first seen on kurnik.org. The first player places 3 stones (2 black 1 white, if black goes first) on the board, the second player has the choice to take black/white or place 2 more stones to change the shape and let the first player choose color. This is essentially a slightly more elaborate pie rule. Computer search by L. Victor Allis has shown that on a 15x15 board, black wins with perfect play. This applies regardless of whether overlines are considered as wins, but it assumes that the rule of three and three is not used. It seems very likely that black wins on larger boards too. In any size of a board, freestyle gomoku is an m,n,k-game, and it is known that the second player does not win. With perfect play, either the first player wins or the result is a draw. This game on the 15x15 board is adapted from the paper "Go-Moku and Threat-Space Search". The opening moves show clearly black's advantage. An open row of three (one that is not blocked by an opponent's stone at either end) has to be blocked immediately, or countered with a threat elsewhere on the board. If not blocked or countered, the open row of three will be extended to an open row of four, which threatens to win in two ways. White has to block open rows of three at moves 10, 14, 16 and 20, but black only has to do so at move 9. Move 20 is a blunder for white (it should have been played next to black 19). Black can now force a win against any defence by white, starting with move 21. World Championships in Gomoku have occurred 2 times in 1989, 1991. Since 2009 the tournament resumed, the opening rule being played was changed and now is swap2.